Gladys is a 1940 graduate of Ogden High School. Milo is a 1939 graduate of Weber High School. He is currently employed with American Packing and Provisioning Company as a supervisor in Ogden. The couple will make their home in Plain City. While short and sweet, there is much more of a story behind those words. Milo and Gladys met in 1940 when Gladys and her sisters rode their bikes all the way to a celebration in Plain City. Later they would meet at the Berthana, which included a dance hall on the second floor (built in Ogden about 1914). The Berthana later converted to a roller skating rink before closing in the 1970’s. The building is still there although I do not know what the use for the building is currently. David Delos Donaldson and Berendena Van Leeuwen are Gladys’ parents. Read more of her parents at this link: Donaldson-Van Leeuwen Family. David was a plumber by trade who had lung problems from being gassed in the Argonne of France in World War I. He suffered from lung ailments the rest of his life. He mostly worked in the Ogden area but worked prior to marriage in Phoenix, Arizona and Twin Falls, Idaho. He also sought work in Boulder City, Nevada during the depression and as a steam and pipe fitter during World War II in Napa, California. Apparently during World War II he worked almost exclusively in submarines. You can read more of their marriage and family at the link above. She went by the name of Dena her entire life. Gladys and Maxine Donaldson ages 5 and 3. Dena grew up LDS and David did not. David’s parents were not active LDS and most of David’s siblings joined the LDS church between the ages of 10 and 22. David and one brother did not. Dena saw that all her children were raised LDS with little difficulty from David. Apparently smoking is what kept him from being baptized (he picked up smoking after being gassed because he said it soothed his lungs). When the time would come for Milo and Gladys to marry, they wished to be married in the temple. For whatever reason, the Bishop determined that he was not going to allow them to be sealed without David being a member. I do not know which Bishop, but I have a suspicion it was Gladys’ Bishop and that he knew the Donaldson family. He probably hoped to bring errant David around so his daughter could get married. The plan backfired. It would not have worked anyhow because David was pretty set on Gladys marrying a wealthy man and would not have minded if the wedding had not gone through. Milo said they wanted to get married and were not interested in waiting around for a Bishop to figure out what he was doing. A week before they were actually married, they decided to elope. They packed up and drove to Evanston, Wyoming on snow covered roads. They arrived and decided they better do it proper with family around. They enjoyed a meal and drove back to Ogden on a very snowy set of roads. Leading them to get married in the Donaldson home the next week or so. It would take them another 34 years before they finally made it to the temple to get sealed. Perhaps the Bishop was inspired. They married in April and World War II was in full swing. They rented a place in Ogden for a few weeks until moving to Plain City and rented there (on 4700?) until they built a home after the war. Milo and a group of buddies then went off to Fort Douglas to enlist in October 1942 rather than wait until they were drafted. They anticipated at least a few more days or weeks in Utah before being shipped off. However, Milo was put on a train that same day to Camp Lewis in Washington. He spent the next two to four months there, he cannot remember for sure. Gladys would move to Camp Lewis to be with him through basic training. By this point the two knew they were expecting a baby. Milo shipped out for Needles, California to Camp Ibis. Due to his experience with building, he was one of the men asked to lay out some of the buildings for the latrines and then helped in starting the construction of those buildings. Their division stayed there a few months before heading off to San Francisco from which he was put on a boat and headed to Hawaii. He landed in Hawaii on the 4th of July 1943 with the loudspeaker welcoming the men to Hawaii and announcing the birth of a son to Sergeant Ross. I have written of that baby at this link: Baby Milo Ross. 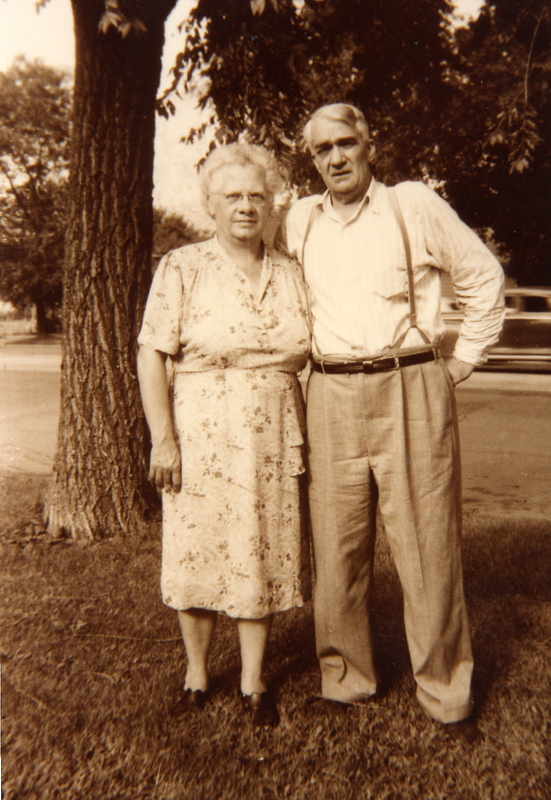 Gladys would live with her parents in Ogden until Milo returned from the rigors of war. Her parents moved from their address on 8th Street down to Washington Boulevard during this time. Milo worked for American Packing and Provisioning Company some in high school and on afterward until he went into the service. American Pack would be sold to Swift & Company in 1949. This packing plant would remain in use until the 1970’s when it was closed. I have written previously about Milo’s loss of his mother in 1925 and her family keeping him from having contact with his father, John William Ross. Here is the link: Ross-Sharp Wedding. He was raised by his Uncle Edward William Sharp in Plain City. Anyhow, the family would go on to have 2 more children in 1946 and 1948. Milo received a homestead in Washington State in the late 1940’s, early 1950’s, but I do not know more about it. 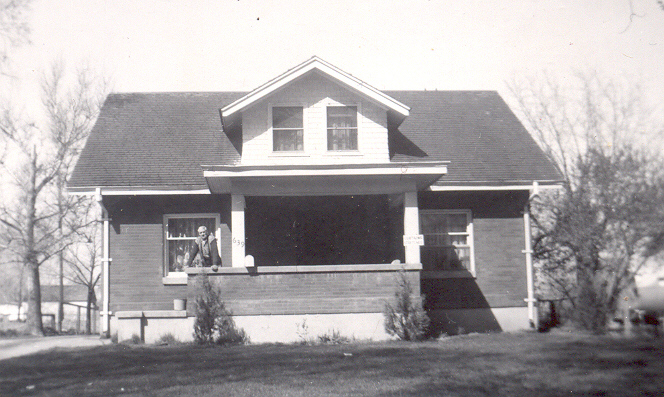 The homestead is believed to have been abandoned because of medical needs of Judy and the family returned to a newly built home in Plain City around 1948 or 1949. The family then built the current home at 2532 N. 4100 W. in 1955 and have resided there since. George Henry and Minnie Van Leeuwen are pleased to announce the marriage of their daughter Dena to David Delos Donaldson, son of Mary Elizabeth Donaldson and the late William Scott Donaldson. 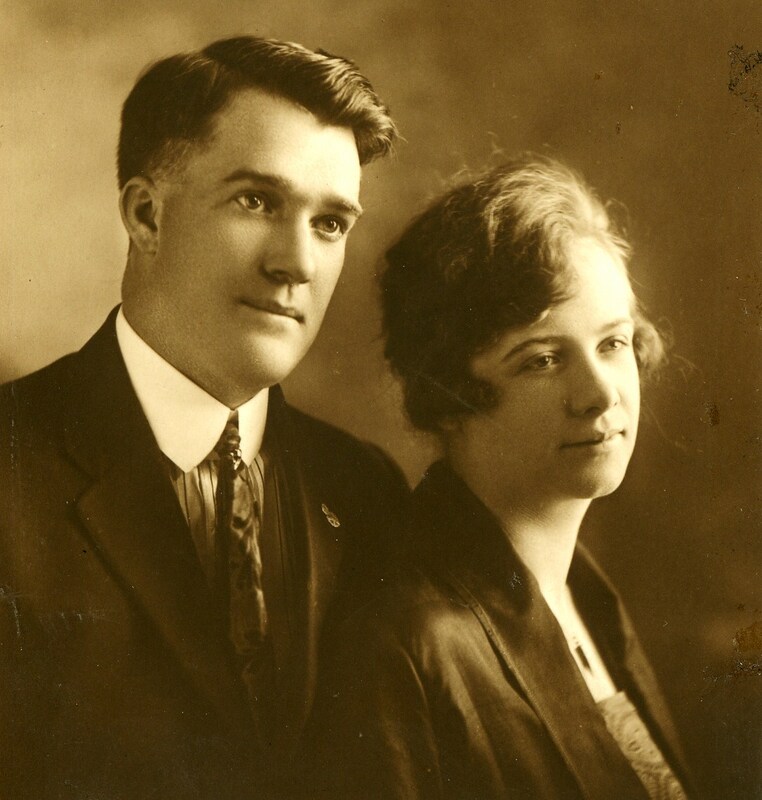 David and Dena were married in Salt Lake City, Salt Lake, Utah on 16 July 1919. David is currently an independent plumber in Ogden, Weber, Utah. The couple will return to make their home at 2310 Grant Avenue in Ogden, Utah. 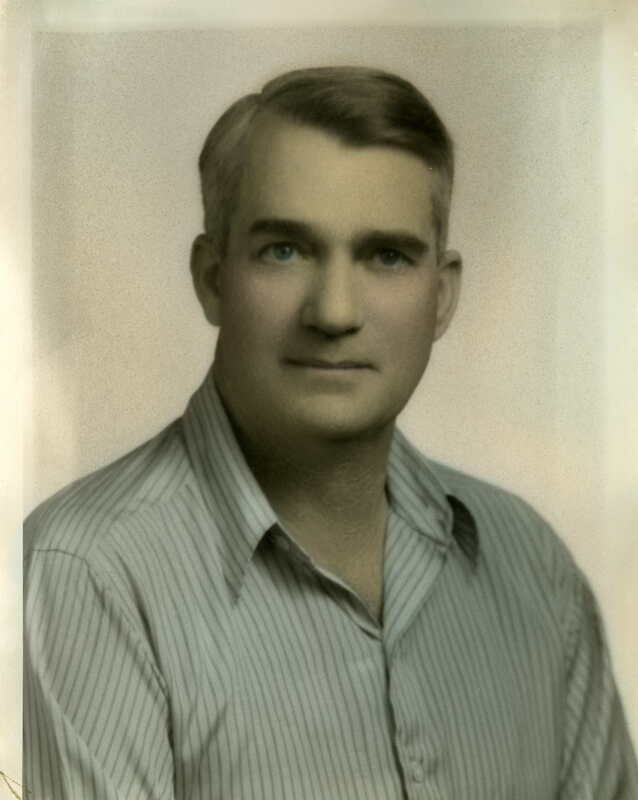 David Delos Donaldson (he went by Dave, his son also went by Dave or Davie, so to keep them clear, I will refer to father as David and son as Dave) was born 26 March 1894 in Evanston, Uinta, Wyoming. He was the second of seven children born to William Scott Donaldson and Mary Elizabeth Williams. I have previously written of David’s parents at this link: Donaldson-Williams. David grew up in Evanston, Uinta, Wyoming and Park City, Summit, Utah before moving to 2270 Moffits Avenue, now 2270 Ogden Avenue, in Ogden, by the time he was six. He lived at this address until he moved to Twin Falls, Twin Falls, Idaho to work for Ballantyne Plumbing Company as a Sham Filler. When he registered for the World War I draft on 5 June 1917, he was living on Shoshone Street North in Twin Falls and listed that his mother and two siblings were dependent on him. He may have listed this in hopes of not being drafted. Ballantyne Plumbing & Heating Company was newly incorporated (about 1916) by Varsell Ballantyne who had just moved from Ogden. Varsell had been one of the incorporators of The Ogden Plumbing, Gas & Steam Fitting Company in 1904 or 05. He had worked in the same spheres as David’s father and probably felt some desire to help the Donaldson family and invited David to Twin Falls. He may also have been the master to which David was an apprentice, or another plumber worked with in the Ogden PG&S Company. While David worked for Ballantyne Plumbing Company, it was located at 145 Second Avenue East in Twin Falls. David lived on Shoshone Street North, probably not far from his employment. The draft card indicates that he had gray eyes, black hair, and stood tall and stout. David served in the U.S. Army during World War I. When he was finally drafted, he went to Utah to report with his two brothers who were also drafted (another brother would also serve in World War I). Unfortunately, the government cannot find his service paperwork and very little is known of his time served. His obituary indicates he served in the 91st Division of the Army. We do not know his dates, but this division fought in the Battle of Saint-Mihiel in 1918 and went on to fight in the Meuse-Argonne Offensive through the rest of the year. It was in the Meuse-Argonne Offensive that David would receive his life lasting injuries to his lungs from the dreaded gasses of World War I. One lung collapsed and never worked again, the other lost a large percentage of its capacity. He would receive weekly treatment for the rest of his life (over 30 years) for these injuries at the Veterans Hospital in Salt Lake. He became a member of the Disabled American Veterans, Ogden Chapter 4. 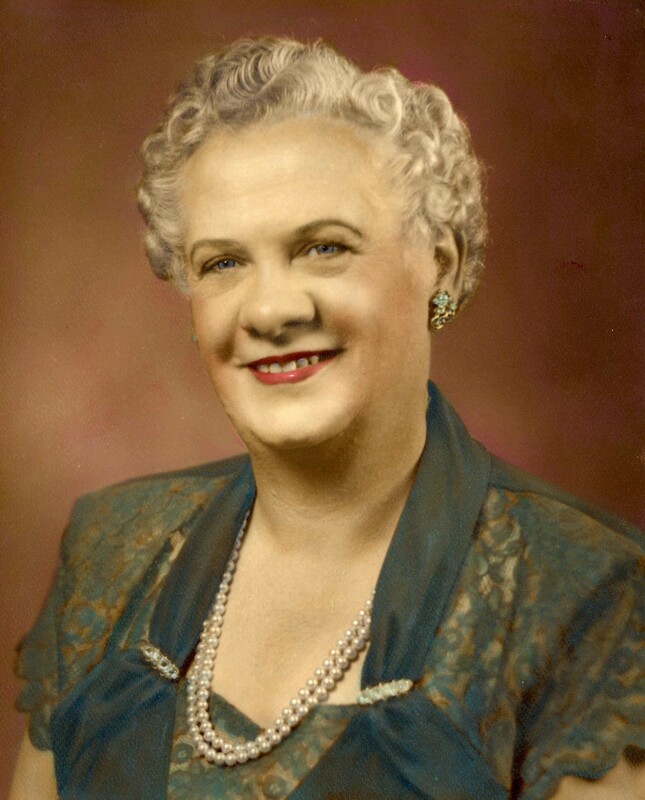 Berendena Van Leeuwen, who went by Dena, was born 28 December 1898 in Ogden. She was the 10th of 12 children born to Gerhardus Hendrik and Hermina Janzen Van Leeuwen. I have written of George and Minnie’s marriage here: Van Leeuwen – Janzen Wedding. Nine of these children would live to adulthood and marry. Both parents joined the LDS church in 1887 and immediately sought to immigrate to Zion. The family immigrated to Utah in 1888. Gerhardus waited until the next year to immigrate. Gerhardus had fallen from a ladder at work giving him head injuries that lead to epileptic seizures and bouts of insanity. These considerations were perceived as mental illness at the time and could have kept the family from being admitted had they all come together. 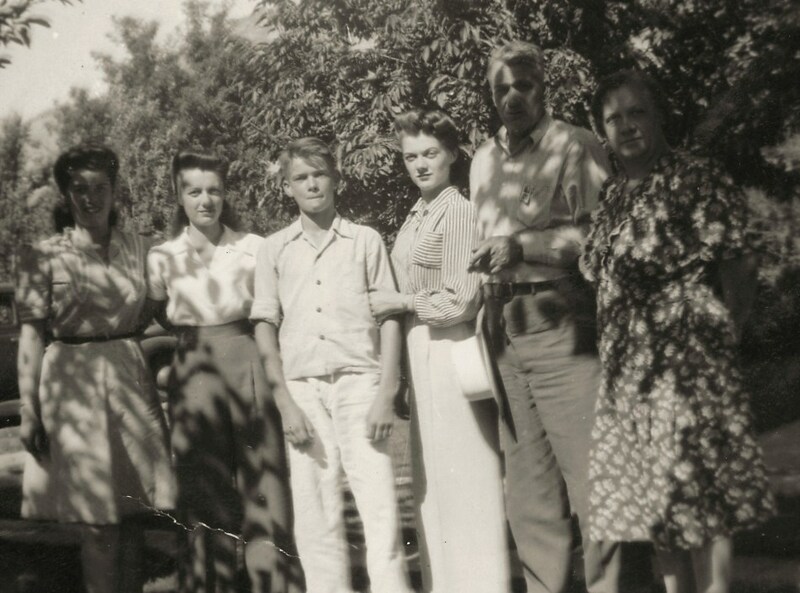 The Van Leeuwen’s immigrated from Arnhem, Gelderland, Netherlands. In the United States, Dena’s parents were known as George Henry and Minnie Van Leeuwen. The Van Leeuwen family lived at various places in Ogden, mostly near Wall Avenue and 33rd Street. Her father worked as a carpenter, more on the finishing side, for employment. George may have even known of the Donaldson family. Dena was baptized in the LDS church 7 November 1907 in Ogden. The family was extremely tight knit and was known for their large and very tasty family meals. If company came over, a meal was put on. George’s head and mental injuries continued to worsen as the years passed. The family either had to keep him safe or calm him down before. By the time 1911 rolled around, his fits were becoming uncontrollable. Dena referred to her “Daddy” as tender and sweet and then at the switch he would become angry and threatening. He had made enough threats and raised enough raucous that neighbors called the police. George was committed to the Utah State Mental Hospital in Provo, Utah, Utah in 1911 when Dena was 13. The family tried to get him out and succeeded. Unfortunately, he lost control again and ended up spending the rest of his life in the mental hospital. The family would drive down nearly every weekend to pick up “Daddy” and keep him for the weekend before taking him back. By the mid 1920’s, they could not even take him home on the weekends his condition was that poor and uncontrollable. “Momma Minnie,” as she was known to friends, died in 1921 in Ogden. George died in 1932 in Provo. Dena as one of the youngest children of the family was known among siblings as telling slight variations of stories to other siblings such that it would cause some contention within the ranks. While the siblings were never distant from each other, a feud of one sort or another was always brewing or being fought. It would always pass, but Dena often started many of the feuds and received a bit of flak for it. David returned from the war and met Dena Van Leeuwen. We do not know about the courtship or how they met. We do not know why they chose to be married in Salt Lake. David and Dena took a honeymoon to California. David resumed work as a plumber in the 1920’s in the Ogden area. 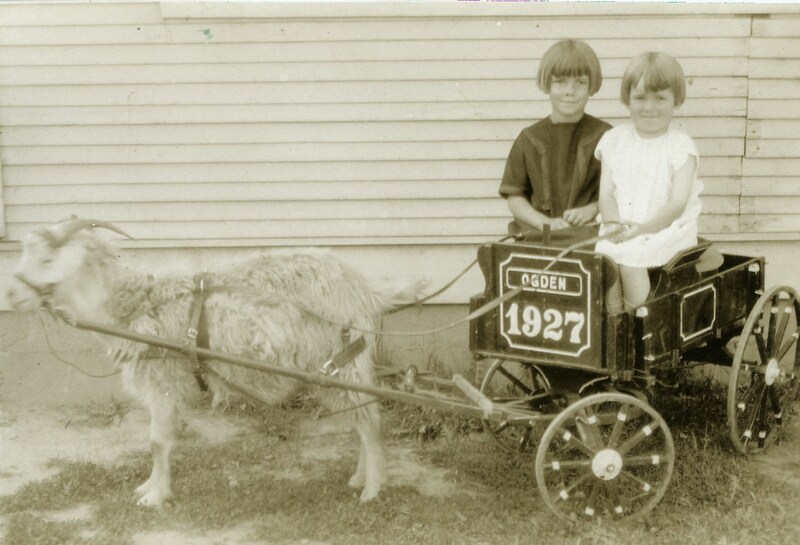 Between 1920 and 1928, 5 children were born to David and Dena, all in Ogden. 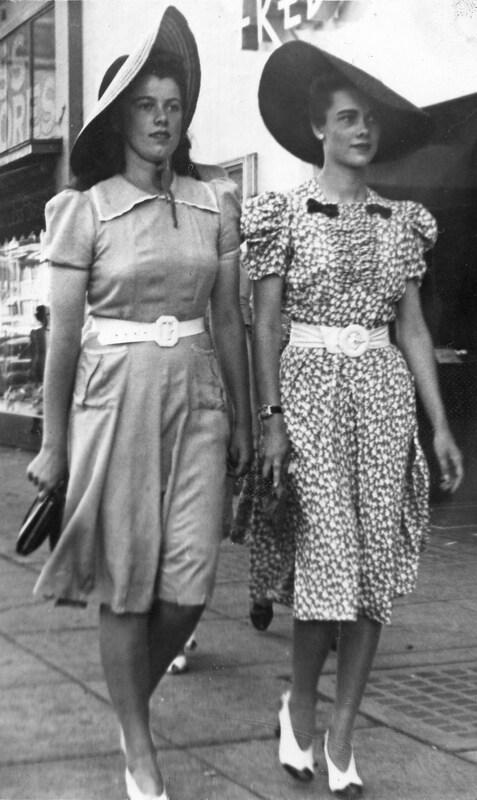 Twins named Dena Dorothy and Dora Mary were born 28 May 1920. 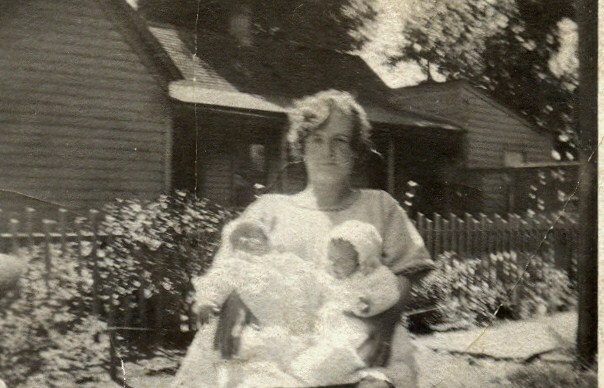 Gladys Maxine arrived 20 September 1921. 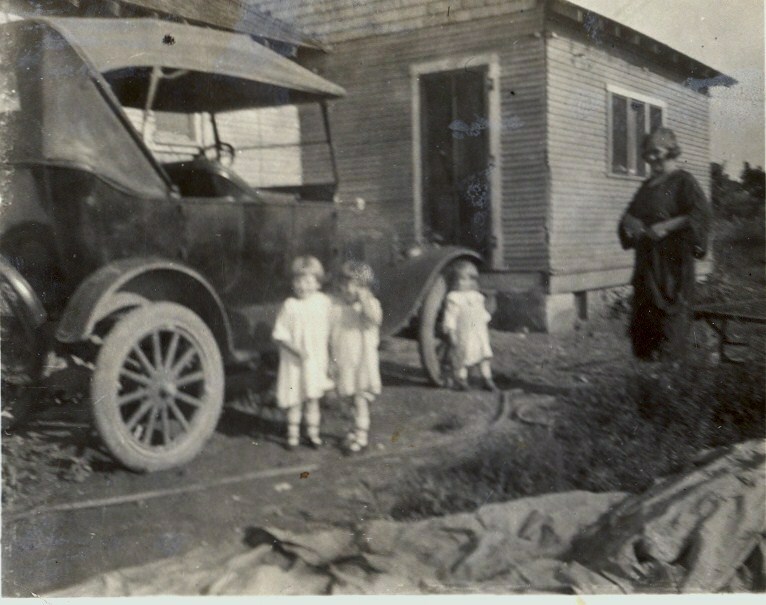 Here is a picture of the three kids with Gladys against the wheel of the car. Maxine appeared 3 August 1924. Lastly a boy, David William came 25 November 1928. 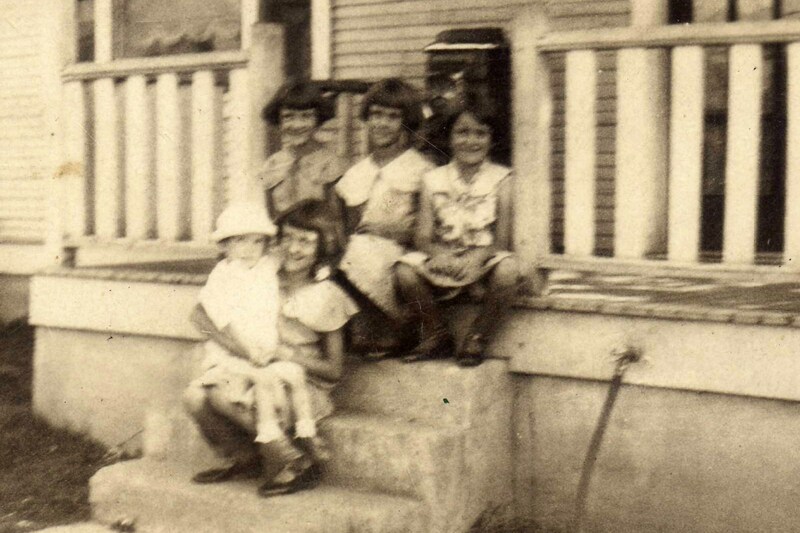 A shot of all 5 children on the front porch of the home that David built at 629 8th Street in Ogden. Here is a picture of the home from the side. You can see from this point that the home is probably older than 1920’s and that Dave probably added the addition onto the back rather than building the entire home. 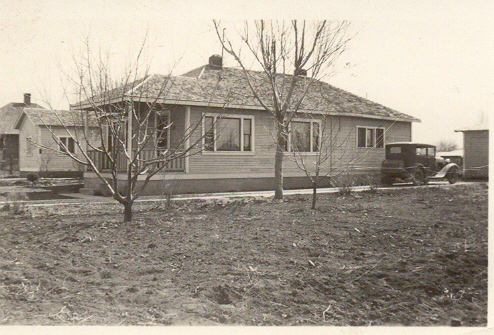 In 1930, the family lived at 753 Browning Avenue in Salt Lake. We do not know how long they were there, but they moved back pretty quickly to Ogden living on 8th Street. Times were hard during the 1930’s so David went to Boulder City, Clark, Nevada to work on the building of the new Boulder Dam (later named Hoover). He also headed to Napa, Napa, California to work in the shipyards as a pipe fitter, primarily on submarines. Jennie Bremer, a niece to David and Dena, told of a funny story when David was replacing the plumbing in their home after a serious earthquake in Los Angeles. David was deathly afraid of earthquakes and while he was working in the basement or under a cupboard if an aftershock hit he would rise up and run from the house. He told Jennie at one point that he did not want to be caught in the basement if the house should fall. Well, being little kids, they played with this some. They would sneak to the window of the room he was working in and shake the screen and windows in a way that sounded like an earthquake. She said it was funny to see a man as big as “Uncle Dave” to hop up and run out of a room like that. They would laugh and laugh over it. They made sure not to do it too often so he would not suspect anything and she does not believe he ever knew of the joke they would pull on him at least once every time he visited. She did comment it was a bit sad to see him winded for a while after he hopped and ran, but the guilt from it would only come later in life as she realized what she had done to him. David would often visit family to help with their homes or other needs. He also come home to Ogden fairly regularly on the weekends to visit the family. 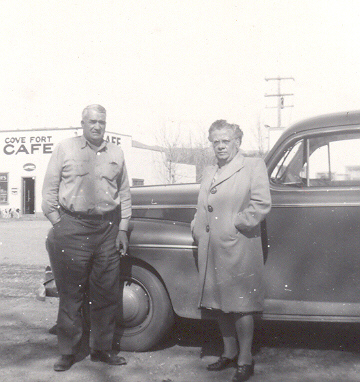 He finally found employment in Ogden at the Ogden Depot in 1937 as Supervisor of Maintenance. 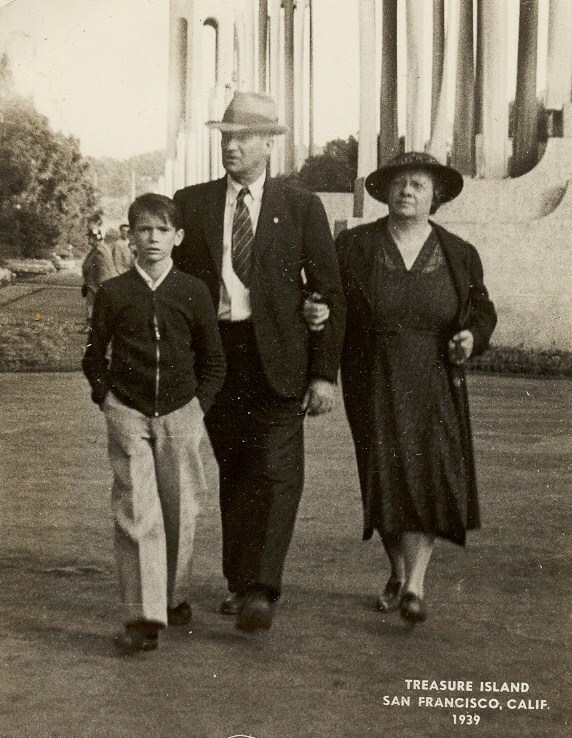 In 1939, the family returned to visit the area David had worked, Donaldson extended family in the bay area, and the 1939 San Francisco World Fair. After World War II, the family moved to 639 Wall Avenue. 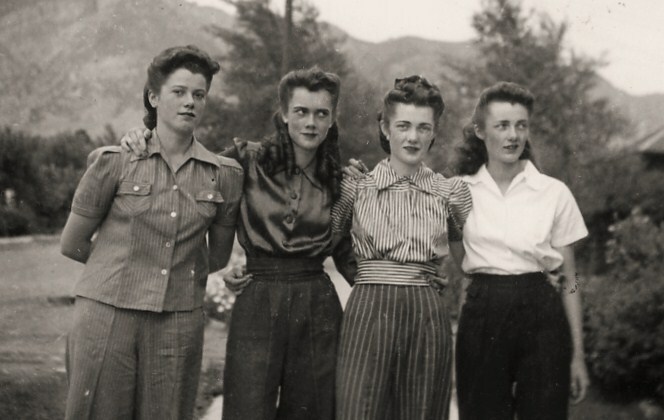 Life in the 1940’s treated the Donaldson family much better, even despite the war. David still had his penny-pinching ways. Dave would refer to David as the “King of the Tight Wads.” Dave started working about 12 years old as a shoe polisher at a barber shop on Washington Ave. David had told Dave that now he was 12, he was expected to be a man and take care of himself, that the Donaldson household would no longer be carrying him. When he brought his paycheck home, David would take half of it for the family. This incensed Dave over the years and he quit reporting his full pay to his father, who took half of it. David even went on to require Dave to pay rent for his space upstairs in the Wall Ave home. Sometime between 1942 and 1945, David’s mother’s husband had passed away and she wanted to move in with the Donaldson family. David tried to get Dave to move his bed to the back porch so his mother could take the upstairs. Dave made it very clear he would move his bed, but it would be out of the house and he would never come back. David’s mother did not move in and Dave kept his “apartment” even after he married. David insisted that Dena only needed two dresses and no more. The family would often buy her dresses, shoes, or other things for her birthday and Christmas, so she did not ultimately go without. But he refused to buy for himself or for her. Dave and Betty Donaldson got a pretty serious scolding one time for buying Dena a crystal berry bowl indicating that it was going to spoil Dena and the family. Dena grew up LDS and David did not. Dena saw that all her children were raised LDS with little difficulty from David. Apparently smoking is what kept him from being baptized. When the time would come for Gladys to marry, the Bishop determined that he was not going to allow them to be married in the temple without David being a member. David had made it known he did not want any of his girls to marry a poor boy and would not submit. All four of the girls married in the next two years, and then Dave in 1953. Interestingly, David never joined the LDS church, but the family put it into the obituary that he was a member. Gladys ended up being married in the Donaldson home on 8th Street, but David refused to allow the Donaldson Bishop to do the honors, so the Plain City Bishop of Glady’s husband, Milo Ross, performed the wedding. 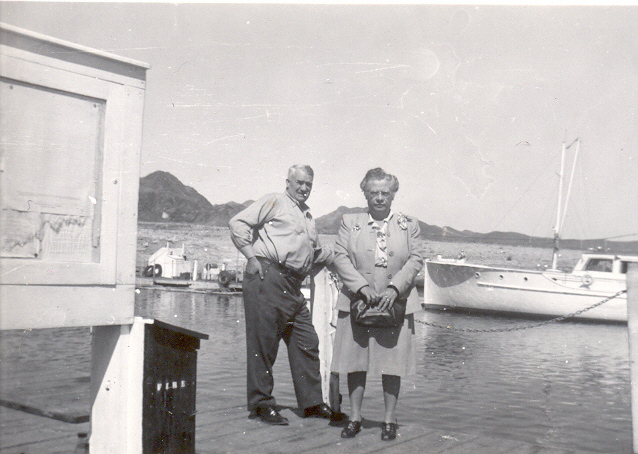 Gladys married Milo James Ross 4 April 1942. Dena married Chauncey De Orr Michaelson 7 December 1943. Maxine married Sterlin Delaino Telford 24 December 1943. Dora married Malcolm Claire Birch 11 September 1943. Dave married Betty May Oram 12 April 1953. David retired in 1949 from the Ogden Defense Depot due to his physical condition and inability to breathe. About this time, the family took a trek to visit family and friends throughout the west and to see some national and church historical sites. Included was Hoover Dam, St. George Utah Temple, Mesa Arizona Temple, Cove Fort, Lake Mead, Las Vegas, Los Angeles, and San Francisco. The family, not caring about the thoughts of others, loaded the car and set off. Dena, who loved and raised canaries, insisted they come with her. So the canaries rode in cages that were wired to the outside of the car (and the canaries lived through the entire trek). Dave joked that driving around they looked like the Beverly Hillbillies in their early 40’s sedan with bird cages wired to the back of the car. David would claim that the only relief he could receive for his lungs was through smoking cigarettes which would calm his breathing and ease the pain. Remembering also, this was also a slogan for some cigarette companies! He picked up smoking while still in the military, but he would become a chain smoker very early on. The smoking would later aid in his death from emphysema. It was not uncommon at all for David to light one cigarette from the one he was finishing. He was also known as a dirty smoker among the family in that he would allow the ashes to fall anywhere and would even throw his butts on the floor in the house, in the toilet, or even leave them in the drain of the bathtub after he finished bathing. David’s lung issues would come back to haunt him more and more as the years passed. The cigarettes were no longer delaying the pain or inevitable loss. His emphysema would come in fits to such a degree that he would be confined to bed and the family would have to place newspaper on the floor around the bed to catch the black phlegm (sometimes bloody) he would cough up. His emphysema would become more and more restraining on his life in the last 5 years of his life. It was the reason he had to take such an early retirement. In the end, he had a couple of days where he was coughing and could not breathe and went to the Veteran’s Hospital in Salt Lake City. After a two day stay, the chronic lung disease caused a cor pulmonale that took his life on 24 September 1953. Four days later, he was buried in Ogden City Cemetery. Dena moved on with her life and kept busy visiting and spending time with family. Dave, who had recently married and was living in an apartment upstairs, decided it was time for a major cleaning of the house. They completely and thoroughly cleaned the home, wall-papered and replaced wall-paper, and replaced the carpets and furniture to remove all the cigarette smoke grease and filth. Betty told me that as long as she knew the family that she really loved Dena. She said everyone loved Dena. She said that when she remembers the home in Ogden on Wall, that every time she drove into the driveway that the curtains would part and a Dena’s curly white hair, bright blue eyes, and big smile poke through with a little wave. Apparently she had an infectious laugh which was both giddy and happy. Four of her siblings were still alive and she had 11 grandchildren by the time 1955 rolled around. Then one day she was visiting at the home of Jane (Jantjen in the Dutch) Bremer, her sister. Dena needed to hurry off and Jane warned her that she should not go. Jane was known in the family for having the gift of foretelling the future. Jane told Dena that if she left at that time she would be in a terrible accident. Dena gave no heed and left to go on her way. Dena was known by all to speed, and she was doing so this day. 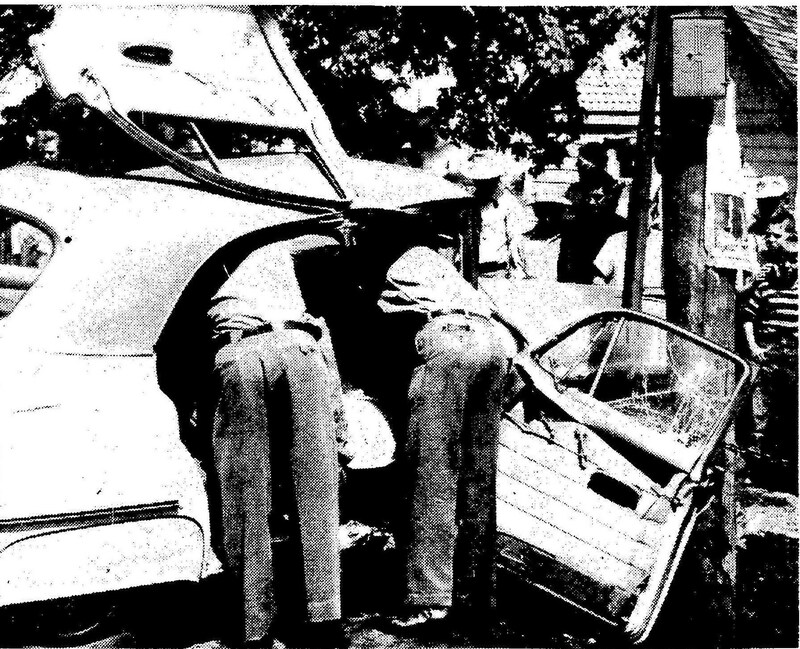 Sure enough, as she drove north on Wall Avenue in Ogden and at reaching 2nd street, a truck made a left hand turn from the right lane and hit the rear passenger side of the 1955 Oldsmobile. Her vehicle was sent careening and slammed broadside into a telephone pole on the north east corner of the intersection (133 feet from the point of impact). The initial hit threw her into the passenger side of the front seat with the passenger door open, her leg partially out of the opened door. Then the impact collapsed the dashboard in on her and slammed the open passenger door on her leg. She broke her hip, leg, and back with a number of other injuries. The door had closed and latched on her leg and had to be cut open. She was taken to the hospital where the family did not expect her to live. She underwent a pretty major hip and back operation. Dena was put into a full body cast for the next six months that reached all the way up to her armpits. Dave created this bar with a rope/cloth over the bed by which she could lift herself up so they could place a bedpan under her to do her business. Betty would help her do the business, clean her up, and make sure her needs were tended. The cast was eventually removed but she could not properly walk or get around very well. She was pretty much confined to her home for the rest of her days. At times a little heat came into a relationship and she would go spend some time with one of her other children, but she came back. She had a terribly heavy hospital bed she used these last few years. Dave made it clear early on that once he moved that bed out of the house again, he was not ever moving it back in so her stays elsewhere were of short duration. 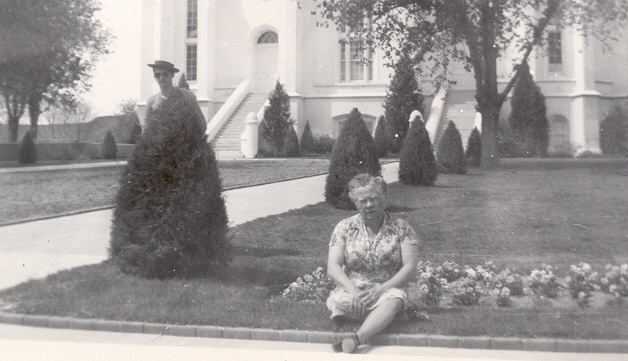 Dave and Betty would take Dena around to visit places and get out of the house. Betty joked that Dena loved to go fishing and that she could catch fish in the gutter if she tried. She had a gift for catching fish. Dave and Betty set up a little camp chair so she could fish on camping trips. They would leave her be for a while and she would giggle at the birds and once and a while one would fly to her. She giggled openly and happily at everything. Her grandson, Milo Ross, remembers her in the full body cast but yet she would smile and the whole world would smile with her. He thought she was a funny lady with tongue twisters, slight Dutch accent, and catchy little jingles. Dena had problems with her body that come from inactivity, like regular kidney stones and other painful problems. But she always had a twinkle in her eye and a contagious laugh. She never, if ever, complained about the lot cast to her in life. On the 5th of March, 1959, Betty Donaldson, Dena’s daughter-in-law had finished work and was headed to the theater to catch a matinee. She felt a distinct impression that she should go home. Dave was at work and she had the whole afternoon free, so she did not see the need to go home. As she waited in line at the theater, she knew she needed to go home so she caught the bus. She made it home and all was well. She changed her clothes and then Dena called up to her. Dena had this sinking feeling in her chest, was not feeling very well, and was asking Betty for help. Betty called the Dr. and for an ambulance. Dave, who never called home from work, had felt impressed to call home. Betty was just headed up to the hospital. Dave met her there. Dena had suffered kidney failure which lead to a heart attack and she passed away that evening around 10:30 PM. She was buried four days later next to David in the Ogden City Cemetery. That quote by Joseph Smith sums up much of what I believe. I have been always so fortunate to end up with the salt of the earth, or at least being amongst them. No matter where I go, or what I do, I have been very blessed. I made a stop at the Oneida County Museum on Saturday. I ended up chatting and visiting with those ladies for a length of time. Most of them knew or knew of my relatives from Samaria. It was a good day. I sat and had lunch with an 88 year old, Daphne King Thompson. She was a good lady. We discussed her lawn, and she informed me about the Welsh Festival that had been revived in Malad. Did you know Malad (Samaria) has the most Welsh people outside of Wales? Yep, it is a bona fide fact. BYU said so! So I think I might join the Welsh Society. After all, some of those Williams, Jones, and Evans are my relatives. Also, seeing where I served in a mission for Northern Wales, and my ancestors really did come from Southern Wales, why not? I can support a good cause. So, if you are interested, www.welshfestival.com It is only $10! Meier and Frank continues to go well. I am now a full time painter. Who would have thought. That Law and Constitutional Studies major has come in mighty handy in telling that paint where to stick and not to. Things are good at work. I like having a my own list of things to do and having my own drive to get it done, rather than a taskmaster of any sorts. Oddly, somehow moving from receiving to maintenance, my opinion actually counts for something. I don’t know how a position change actually gave me intelligence in the presence of others, or at least an opinion to be expressed. I stopped to visit my cousin Ralph Naef. He is a 1st cousin, twice removed. We share Regina Nuffer for an ancestor. He came to our reception, which is a great thing, seeing how we had never met. I promised I would stop to visit him. We had a great conversation. But moreover, he gave me a book. Oh yes, more to add to my family history. It contains the whole Naef family history, but I am only going to add the descendants of Charles Daniel Naef. Ralph was telling me, that he has 600 and something direct descendents, and like 900 if you include spouses. That is simply amazing. That is from a number of descendants that was compiled over 10 years ago. So I am sure there is well over a thousand now. A good friend of mine from work, Bob Corliss, allowed me to look up some records on the internet with his information. I stumbled upon a registration form for my great grandfather, David Delos Donaldson, and WWI. He was working in Twin Falls, Idaho. The best part is, we never knew he went to Idaho, ever. Not only that, he was working there, and was exempted because he was working to support his younger siblings and mother. He did later enter, we don’t know when or how, but went to France in the Argonne and was gassed there. He suffered his whole life and eventually died from the mustard. With this information, I went to visit my Uncle Dave Donaldson because my Dad did not know anything. So I picked his brain. We know little about my Great Grandfather before he married. Now we know he was working for Ballantyne Plumbing in Twin Falls in roughly April 1917. 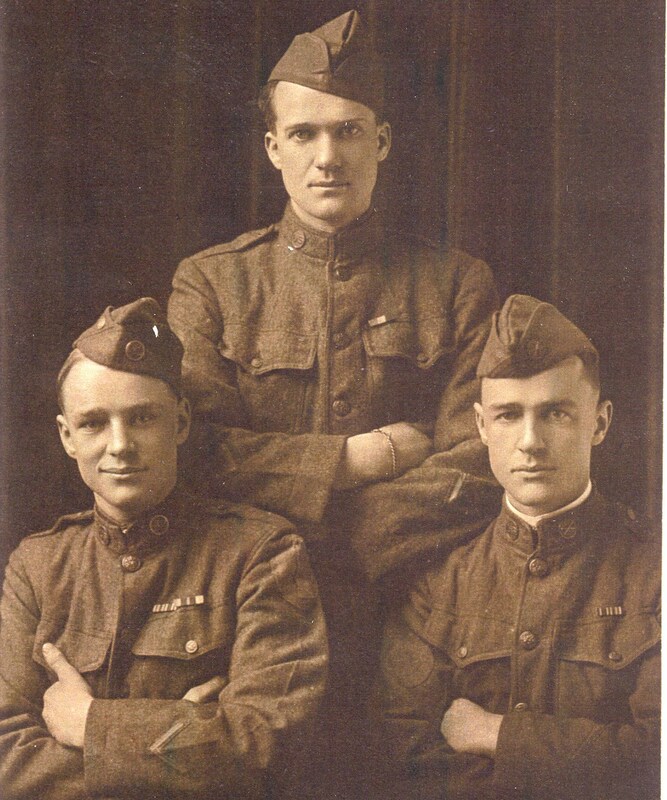 He served in WWI with two brothers. As mentioned, he was hit with mustard, spent some time in hospital, and he wasn’t getting better, so they sent him home. 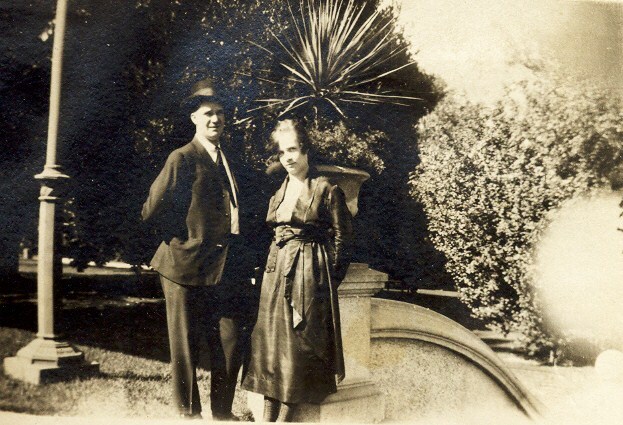 He married my Great Grandmother in 1919, Berendena Van Leeuwen. They had 5 children. During the great depression he worked down south as a plumber. Dave did not know where, but there was a possibility it was at the Hoover. When they went on a trip to Los Angeles, he insisted on stopping at Boulder City and the dam on the way home. Oh, we do know that before they got married, he worked as a plumber in Phoenix. How long we don’t know, but he could not bear the heat down there. During the depression when he worked down south, the family stayed in Ogden. Dave was young enough that he did remember his father coming home, but not where from. Again during WWII, the whole family moved to Napa, California and Great Grandpa was a plumber at the naval yard there, he made it sound like Oceanside. I do not know if there were any other naval bases down there. Then they moved back. The family must not have stayed down there, or he did not work the entire war, as my Grandpa and Grandma met in 1941-1942 at the Berthana on 24th street Ogden at a dance. 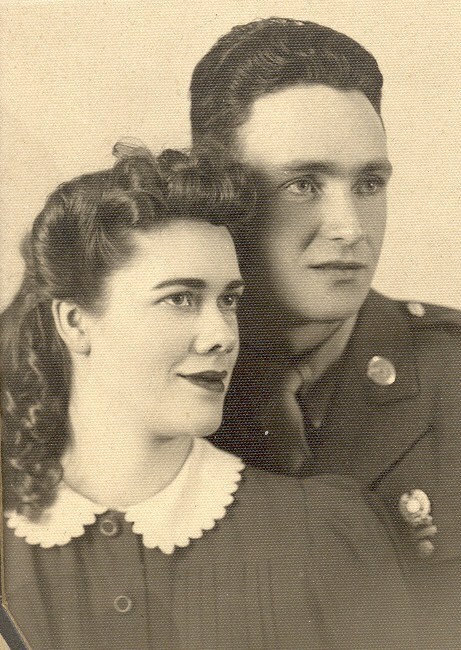 They were married in April 1942, shortly before he left for war. They were not allowed to be married in the temple because Great Grandpa was not a member of the church. I am not sure if this was to get him to join or what, but it backfired. My Dad was born on 4 July 1943. My father did not see my Grandpa until he was 3 years old when he returned from war. Anyhow, Great Grandpa was a plumber by trade. He worked up until the 1950’s when his health failed him. He picked up smoking because it soothed his lungs. It sounds like the mustard burned his lungs the rest of his life. He would smoke to deaden the nerves. Dave told me this increased until he died. Even the last few years of his life, he had oxygen when he went places and when he slept. But he kept smoking. Dad told me of one of the few memories he had of his Grandpa. He went to visit him in Ogden, Grant Ave if I remember right, and he was laying in bed. There were newspapers all over the floor. He got into a coughing fit and coughed a big thing of phlegm up and it went on the floor. It was the combination of the irritation to the lungs from mustard, and the smoking. It was what eventually killed him. I was told the story that when he had had enough, he had my Great Grandma cook this big dinner, and he ate it, and then passed away afterward. Apparently his body could not handle certain foods, especially meats. He just could not take it any more and wanted a full meal. Dave told me that David Delos Donaldson’s father, William Scott Donaldson was a plumber also. Supposedly he had a confectionary in downtown Ogden at one time as well. We have a picture of them standing in the store. His mother, Mary Elizabeth Williams, was according to Dave a witch with a b. She was high minded, snooty, and a brat. Dave said never once that he was in her presence did she ever notice him or give him the time of day. He said she was very negative and a condescending person. Nothing went right, everything was wrong, and it was everybody’s fault. He never liked his grandma, and would rather move out than be in the house when she went to move in. At one point, Great Grandpa did not allow her to move in because Dave would move out. She was the daughter of David D Williams, whose brother, John Haines Williams, is the father of those Williams who settled Samaria, Idaho. All those William’s in the Malad Valley are my relatives, and they are the Welsh I spoke of earlier. 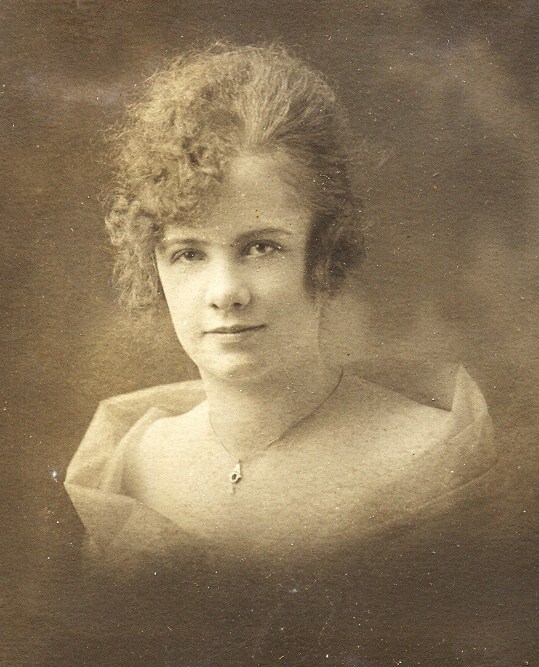 Berendena Van Leeuwen, my Great Grandmother was an amazing lady. Everybody loved her. Betty, Dave’s wife, told me that whenever she thinks of the Donaldson home in Ogden, she sees herself pulling in the drive, and the curtains parting and this little curly headed woman with a big smile with a little wave beaming at her. She was an amazing cook, never using recipes. She had an infectious laugh and loved everybody and everything. In 1955 she was in an auto accident that handicapped her the rest of her life. 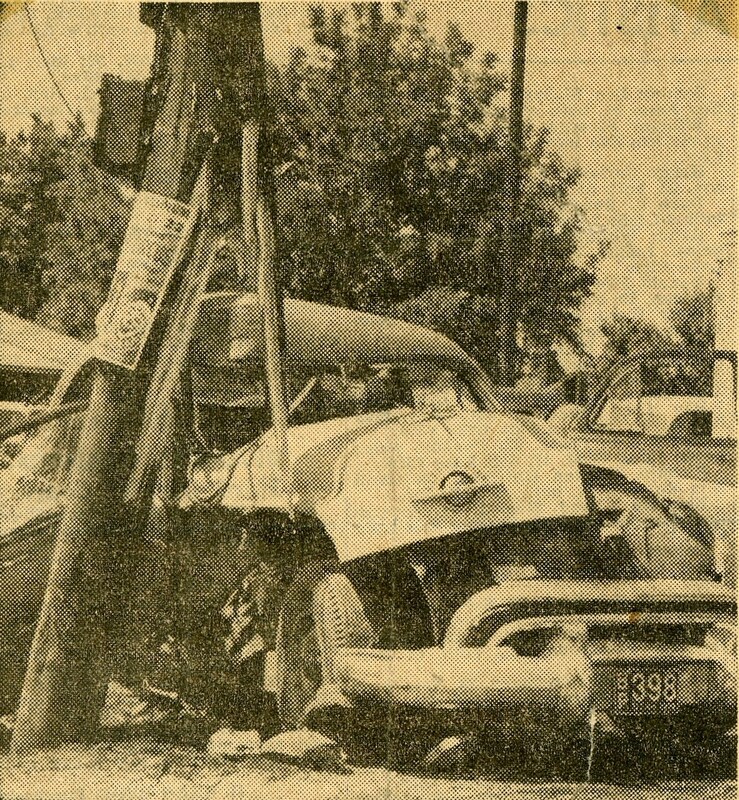 It was an Oldsmobile 88 that she went to pass a semi and he put her into a telephone pole. She did some major damage to her hip. She had a full body cast for a long time. She had over 14 major operations. The final one, one for kidney stones, weakened her enough that she died shortly after. Despite 4 years or so of being handicapped, Dave and Betty told me that she was as chipper and happy as ever. It did not even seem to phase her. They took her camping several times, but the one they remember is the one before she passed away. They would be out fishing and they would put her in a chair on the bank to watch. She would giggle at the birds and them. Betty insists that when she smiled the whole world brightened. Dad remembers Great Grandma coming to visit with her monster bed. Dave remembers that very well too! After she went out to live with Grandpa and Grandma two different times for about a month each, he said she could go, but he was moving the bed no more. Dad remembers her in a full body cast but she was funny. Dad would tell me about Grandma always having home made bread. They got in trouble more than once for coming home and taking some when they should not have. Dad also told in Grandma’s funeral how Grandpa would come home, sneak in, ask if anyone was looking, and lay one on Grandma. Other times he would come in and they would start dancing in the living room. During the war, Grandma and Grandpa would kneel at 9 o’clock no matter where they were and pray. In the spirit of oneness. Anyhow, that is all I am going to share now. There was more about David Delos’ siblings. But I am not so sure on all that, need to do another interview, then I will comment.